NES Classic Edition – Special Launch at Nintendo World Nov. 10th & More! – 3WIREL! NES Classic Edition – Special Launch at Nintendo World Nov. 10th & More! The release of the NES Classic Edition is a big release from Nintendo for the holidays and they plan on celebrating this launch with a lot of stuff from November 10th through November 13th. While playing one of the 30 great NES games included on the NES Classic Edition during the weekend following the Fridaylaunch, you might find yourself puzzled by some of the more challenging games. (“How do I find the first Warp Whistle in Super Mario Bros. 3?” you might ask yourself.) If your memories of the original games fail you, no need to fret. You can just call the Power Line, which will return and run from Nov. 11 to Nov. 13, between the hours of 6 a.m. to 7 p.m. PT each day. The original Power Line was a beloved service in the ’80s that connected fans to Nintendo Game Play Counselors who offered helpful tips and tricks. In this fully automated version, you can use your real-life phone (bonus points if it has a cord!) to dial (425) 885-7529to hear recorded tips for several games, plus behind-the-scenes stories from original Nintendo Game Play Counselors. You never know what you might learn! With 30 great NES games, a replica of the original NES controller, three display modes (including one that makes your fancy hi-def display look like a retro tube TV) and Suspend Points for easy on-the-spot saving, the Nintendo Entertainment System: NES Classic Edition is a great value at a suggested retail price of only $59.99. The stocking-sized console launches on Nov. 11. 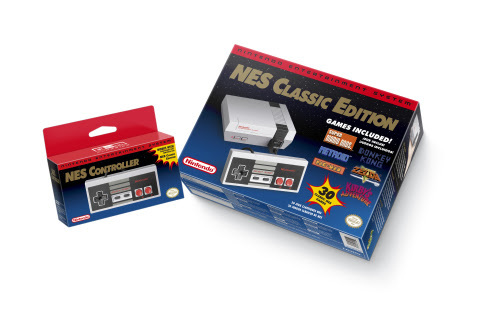 For more information about the Nintendo Entertainment System: NES Classic Edition, visit http://www.nintendo.com/nes-classic.